Americans love pizza. I know it. You know it. The cheesemakers of the world know it. Even the USDA reports one in eight Americans will open that familiar cardboard box and devour a slice of pizza every day. It doesn’t stop at the U.S. border. Global demand for pizza is growing, with brands like Michigan-based Domino’s selling more than 500 million pizzas worldwide each year. But where would pizza be without cheese? Some may say the perfect cheese makes the perfect pizza. And, of course, the best milk makes the best cheese. Behind some of the most well-known pizza makers in the world, stands an innovative company that has made itself the largest pizza cheese manufacturer in the world: Leprino Foods Company. 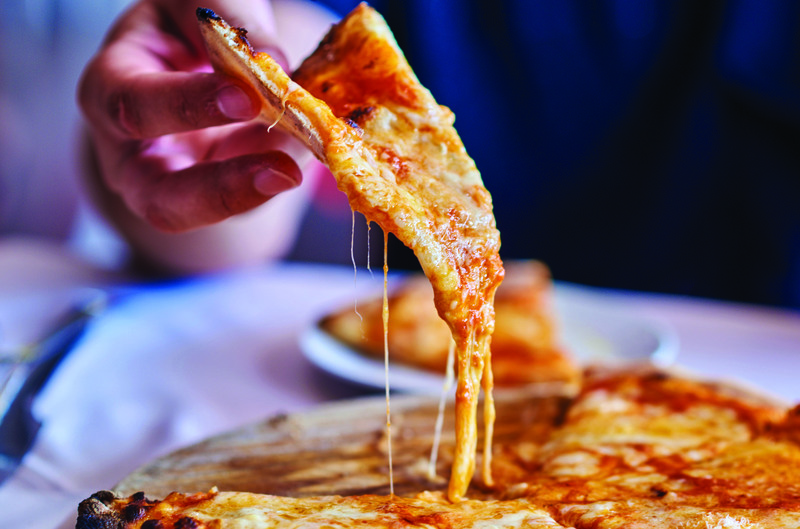 Better yet, the Michigan Milk Producers Association (MMPA) teams up with Leprino Foods to supply some of the milk to make all that great cheese for your pizzas. After over 30 years of being “Partners in Progress,” MMPA honored Leprino Foods at its 102nd Annual State Delegate Meeting with the Valued Partner award on March 15. The award program, now in its second year, recognizes an organization that shares values with MMPA and demonstrates a steadfast commitment to working together with MMPA. “We are grateful for our mutually-beneficial relationship with Leprino Foods. Together, our quality milk and Leprino Foods’ innovative technology create value for the industry and MMPA dairy farmers. Our work with Leprino Foods showcases the lasting power of collaboration,” says Joe Diglio, MMPA General Manager. The road to pizza cheese prominence for Leprino Foods was paved with product expertise, innovation and a “relentless pursuit of quality.” The starting point was in Denver, Colorado in a small corner grocery store. “Leprino Foods has a very special history,” says Mike Durkin, president of Leprino Foods. The company’s founder, Mike Leprino, Sr., began making Italian cheese in the store in 1950, under the “Gina Marie” brand. “The name symbolized the highest quality and standards of Leprino Foods’ products,” Durkin explained. Current chairman of Leprino Foods, Jim Leprino, joined the family business in 1956 with an eye on a growing demand for pizza. Eating habits were undergoing a shift during this time as dinner habits changed and soldiers returning home from World War II had developed a taste for pizza. Neighborhood pizzerias were popping up across the country and today’s pizza chain giants were first opening their doors. America’s love for pizza was budding. Jim Leprino envisioned a way to capitalize on this trend. He wanted his family’s cheese on top of the ever-increasing number of pizzas in America, beginning the company’s drive to innovate. By the 1980s, Leprino Foods was continuing its growth through innovation to become the company it is today. The company had entered the international market for the first time with exports to Japan, added plants in New York, Pennsylvania and California, and launched the company’s game-changer: “Quality Locked” ® Cheese (QLC®), which is quick frozen shredded or diced cheese, ideal for meeting the needs of pizza chains. With more forecasted development, the company turned its attention to the Midwest and, specifically, Michigan. Then, on a mild spring day in 1988, ceremonial gold painted shovels punctured the earth in Allendale, Michigan. They were marking the construction of a new mozzarella cheese plant, owned by a farmer’s cooperative and managed by a rapidly growing cheese company. 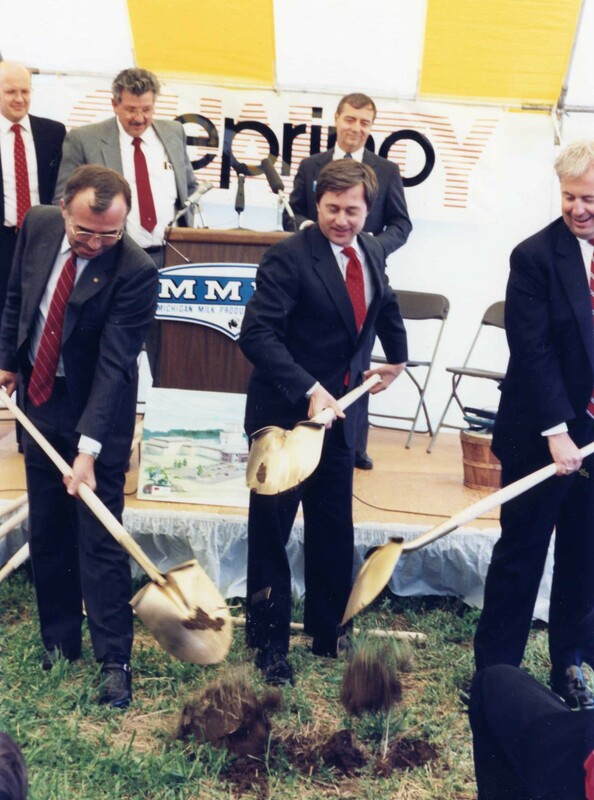 Wielding those shovels were MMPA’s own Elwood Kirkpatrick, alongside then Governor of Michigan, Jim Blanchard, and then president of Leprino Foods, Wes Allen. The ceremony came about after extended negotiations between Leprino Foods and MMPA to form a 20-year, two-plant agreement. MMPA and Leprino Foods together built the plant in Allendale and converted MMPA’s plant in Remus, Michigan to mozzarella cheese production. “It was a complicated arrangement that required vision and faith in each other’s abilities,” reflected Carl Rasch, MMPA’s former director of milk sales. The two plants in Michigan, now fully owned and operated by Leprino Foods, initially processed 2.2 million pounds of milk per day, but have since grown by 60 percent. With continued growth of mozzarella cheese and pizza anticipated, the agreement positioned both MMPA and Leprino Foods well for the future. “[The MMPA-Leprino agreement means] MMPA members’ milk will be used to an even greater extent in the fastest growing segment of the dairy business: mozzarella cheese,” Walt Wosje, former MMPA general manager, said at the onset of the partnership. Leprino Foods’ predictions of more growth in pizza—and its cheese—came true. In 1987, American per capita consumption of mozzarella cheese was 5.6 pounds, after a few years of steady growth. Fast forward 30 years and mozzarella cheese consumption has more than doubled to almost 12 pounds per person per year. In the mid-2000s, mozzarella beat out cheddar as the most popular cheese variety and has remained number one ever since. Mozzarella can thank the $128 billion global pizza industry for its acceleration to the top. Leprino Foods is a prominent contributor to the pizza cheese market as the world’s largest mozzarella cheese manufacturer, but also has a strong presence in nutrition products used in infant formula and sports nutrition. The company employs more than 4,000 people and has nine manufacturing plants in the United States. Their global reach includes sales in 40 countries, offices in Asia and joint ventures in the United Kingdom and Brazil. “Our success is tied to our customers’ success. That’s why we challenge ourselves to think like our customers and create products that perform optimally for each individual application and end use,” says Durkin. Leprino Foods focuses on research and development to create technological advances in their products, according to Durkin. Patented products like QLC, which is made in Allendale, are developed specifically with customers’ needs in mind. According to Durkin, Leprino Foods’ future involves sticking to what’s worked. Continued innovation in cheese and nutrition, while focusing on quality, service, competitive price and ethics, he hopes will guide continued success. But one thing is certain—you need great milk to make great cheese. This article was originally published in the June 2018 issue of the Michigan Milk Messenger.